The Independent National Electoral Commission (INEC), has ordered the removal of 190 non-Nigerians from the Register of voters'. In a related development the commission has decentralized the on-going nationwide Continuous Voter Registration (CVR) exercise in Anambra State to the registration areas, as part of preparations for the governorship polls in the state. 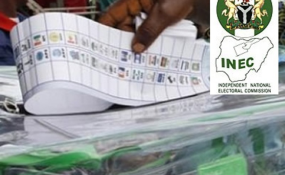 It would be recalled that the Nigerian Immigration Service (NIS) recently announced that it had retrieved several Permanent Voter Cards and National Identity cards from foreigners who were alleged to have registered as voters. INEC has continually reiterated that it would not rest on its oars at ensuring that the Voter Register was free from unqualified registrations in order to ensure the register of voters' met internationally accepted standards. The Commission further said it would continue to strengthen its relationship with security agencies and other organizations in ensuring that the electoral process is improved. According to the Director Voter Education and Publicity Oluwole Osaze Uzzi in a statement yesterday, the registration area level CVR exercise in Anambra which would continue till Tuesday 15, August 2017. He stated that the move by the Commission to decentralize the registration from the 21 Local Government offices to the 326 Registration Area's in the state, is aimed at bringing the exercise closer to the people as well as to ensure every eligible Nigerian in the state was captured in the exercise. The Commission warned that the Registration Area CVR exercise in Anambra, should not be mis-understood for a fresh voter registration, but should be seen as an opportunity for eligible citizens who have not registered before and those whose names were not found on the voters register to get registered. The CVR exercise also provides a window for those who wish to transfer their registration details to another location to do so, as well as to provide room for those who have lost their Permanent Voter Cards (PVCs) to apply for replacements. The Commission would display the register of voters in Anambra state at the registration centres from Wednesday 16th August to Sunday 20th August, to enable registrants check the details of their registrations and seek for correction where necessary. The CVR exercise in Anambra state will officially be suspended on the 16th of August, 2017until after the governorship election to enable the Commission print and distribute the PVCs of all registered voters in Anambra state.